Having an SSL Certificate on your domain helps improve the security of your website by encrypting all of the incoming and outgoing information, and is essential if you’re going to be processing payments directly on your website. Back in August 2014, Google announced that they would now be using HTTPS as a ranking signal, and pages which have HTTPS enabled will benefit from a minor boost in rankings. WebWorldCenter one of most affordable SSL certificate provider to give your site the full benefit, you should enable site-wide HTTPS. Due to the high level of validation provided by Extended Validation (EV), certain paperwork is required before these certificates can be issued. Please Note: An SSL certificate requires a dedicated IP address to be assigned to your cPanel account. 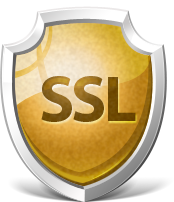 Comodo SSL certificates are the easiest way for online businesses to protect customer transactions with SSL security. Featuring fast online issuance, the strongest possible levels of encryption and our award-winning customer service, Comodo SSL lets you create a highly secure e-business environment hassle-free.